Note: Certain early or original functions in H+Soft Arcade are no longer available, such as links to web and info pages and the original deleting and downloading of games for the software is no longer necessary or supported. 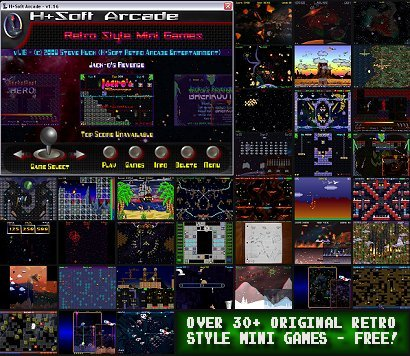 Play all 37 of the H+Soft (HsRetroGames) original retro style, anaglyph 3D and mini games in one convenient download. To select and play games use your mouse, keyboard or game pad controller. You can download and play the games individually - HERE.